Visit a portion of the renowned and lovely white sand shoreline and new fish supper at jimbaran straight shoreline local eatery. Is an extraordinary excursion to appreciate having sun shower along the white sand shoreline, swimming in a spotless ocean water or surfing with incredible wave for your enterprise. Meeting and assistance on arrival and transfer to hotel. Bali is an island and province of Indonesia. which has seen a significant rise in tourists since the 1980s. It is renowned for its highly developed arts, including traditional and modern dance, sculpture, painting, leather, metalworking, and music. The Indonesian International Film Festival is held every year in Bali. Lunch and dinner would be your own arrangement. Overnight stay at the hotel. Morning breakfast at the hotel and the rest day at leisure. Lunch and Dinner at own arrangement. Overnight stay at the hotel. 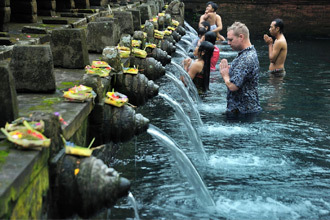 Proceed to Celuk, the center of exquisite silver works and Mas for its fine woodcarvings before visiting the holy spring of Tirta Empul surrounded by a large shrine to the God Indra. There are bathing pools which are believed to have strong curative powers. On the hill behind this temple is a presidential guesthouse built by the late President Soekarno. Our next stop is the town of Kintamani. Inscriptions from the 10th century indicate that Kintamani - a high mountainous area that takes its name from the wind-blown town at 1,500 meters - was one of the earliest known kingdoms in Bali. Enjoy your lunch - the breathtaking view over the caldera lake, Danau Batur is a Wanderers Moment! Going down the hill, we pass the greeneries of Tegallalang with its rice field and coconut trees, to stop at one of Ubud”s art galleries and also Tohpati, which is known for its batik. Overnight stay at the hotel. Morning at leisure after breakfast. A sunset outing to the southwestern tip of Bali for a visit of the Uluwatu Temple, which is perched precipitously on atop sheer cliffs that drop straight into the pounding surf, 250 feet above the sea. This is one of the grandest and oldest temples in Bali that is built in 11th century. Watch the spectacular sunset overlooking the Indian Ocean and enjoy the mystic atmosphere before we drive you to Jimbaran Beach for extensive BBQ Seafood Dinner on the beach. Overnight stay at the hotel. Morning after breakfast at hotel proceed for an excursion which will lead you to the rural heartland of Bali which presents an altered landscape and a different history. Your first stop is Pura Taman Ayun, founded by the King of Mengwi in the 17th century. It has three ascending levels of spacious courtyards containing rows of shrines and pavilions and is surrounded by wide moat. The next visit will be Lake Bratan, a crater lies serenely in the midst of an elongated valley which was formed centuries ago. A small temple called Pura Ulun Danu Bratan to honour Dewi Danau, goddess of the lake, can be seen on the lake promontory. Stroll along Candi Kuning market, where local fruits, vegetable and flowers are sold. After lunch, the trip continues through breathtaking valleys of rice paddies near Jatiluwih to visit Pura Luhur Batukau temple, in dense jungle near the peak of Gunung Batukau, Bali”s second highest mountain. The ancient temple complex has a number of separate sanctuaries joined by damp mountain paths, bubbling spring and a large rectangular lake with a shrine in its midst. Overnight stay at the hotel. Morning after breakfast at the hotel rest of the day at leisure. Lunch and Dinner at own arrangement. Overnight stay at the hotel. Morning after breakfast at hotel, in time transfer to the airport to board flight for your onward destination.